These spare poems evoke the haunting nature of the Quabbin Reservoir wilderness area created in the 1930's when four towns and seven villages were razed and flooded to provide drinking water for Boston. More than 3,500 people were displaced from the Swift River Valley in western Massachusetts. 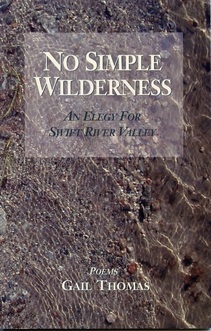 To order a signed copy of No Simple Wilderness: email Gail or send a check or money order for $10 + $2.00 postage to Gail Thomas, P.O. Box 60044, Florence, MA 01062.